The heart of the Land of Maramureş is undoubtedly Sighetu Marmaţiei, known locally simply as Sighet. 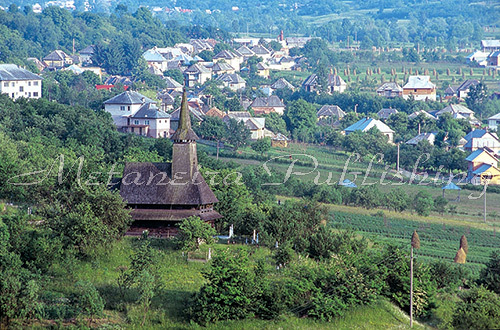 The town is situated right next to the border with the Ukraine, at the confluence of Iza and Tisa rivers. Due to its strategic location, near the confluence of the main rivers of Maramureş, Sighet is the most obvious starting point for visiting the famous valleys: Tisa, Iza, Vişeu, Mara and Cosău. It can be accessed either by train or by car, on DN 18 and DN 17C. 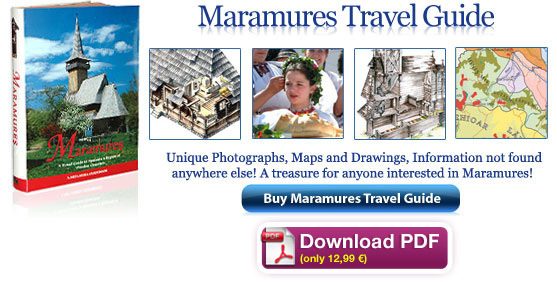 Besides its museums and the annual festival of winter customs and traditions, the city has several other attractions. On Solovan Hill, at whose foot the town sits, there are the ruins of a Dacian fortress. The central square of Piaţa Libertăţii was planned and built around the 15th century, but the present buildings are from later periods. 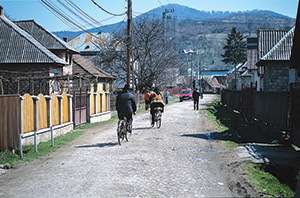 The outskirts of Sighet are just like any village. 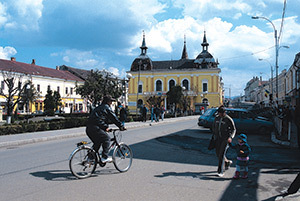 One of the main tourist attractions in Sighet are The Museum of Maramureş Sighetu Marmaţiei, The Ethnographic Museum, The History and Archaeology Museum and The Natural Sciences Museum. Worth visiting is also the Memorial House of Elie Wiesel – The Museum of the Jewish Community. Near the centre is The Monument of the Holocaust raised in the memory of the about 38,000 Jews of Maramureş killed in the Nazi concentration camps. Another memorial for those killed in Auschwitz is The Monument of the Soap (Monumentul Săpunului) at the Jewish cemetery. The Synagogue, built in 1885 in an eclectic Moresque style, is the only one of the town’s eight synagogues still standing and in use. 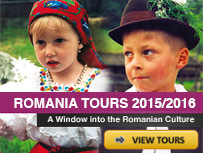 Ever since 1968, on the 27th of December of each year, a winter carnival is held in Sighet. The heart of the carnival is the parade: hundreds of costumed and masked people, horses and carts sing carols, utter “urături” (good wishes for the year to come) and perform traditional winter plays with Capra (The Goat), Ursul (The Bear), and Viflaimul. 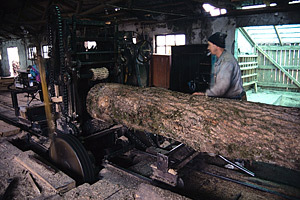 Logs are processed and sawn into planks. 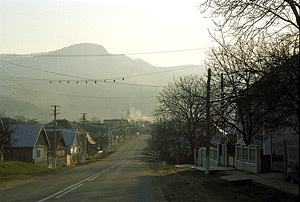 Some seven km downstream from Sighet, right on the Tisa, is the village of Sarasău. It can be reached by car or by regular bus service from Sighet via the DN 19. Here on the border, one never knows if the sun rises in Romania or in the Ukraine. 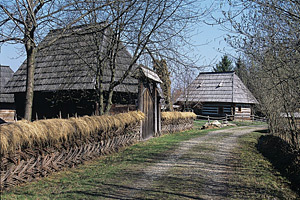 There is a small sawmill in the village that used to be communal. The machinery is old and often broken, and the present owners do not know if to invest in the repairs. Another 10 km further downriver, at the foot of the Igniş Mountains, there is one of the most famous villages of Romania: Săpânţa. It is a big village with vast fields, meadows, orchards and forests. 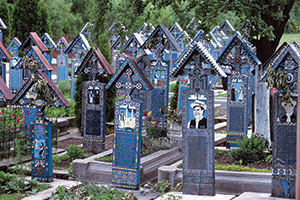 The fame of the village is mostly due to the unusual cemetery called The Merry Cemetery, and to the memorial house of the sculptor Stan Ioan Pătraş. Recently another attraction was added to its portfolio: the Monastery of Săpânţa-Peri with the tallest wooden church in the world. Other local artefacts include sculptures of wood and clay, paintings, and the small straw hats worn by men, the clop. Săpânţa is well known for its mineral water springs that are used to cure various disorders, such as gastritis, ulcers, colitis, diabetes, etc. Rona de Jos is on the other side of Sighetu Marmaţiei, in the valley of the Ronişoara River, one of the many tributaries of the Iza River. It is just over 10 km from the town, on the national road DN 18 that leads on to Vişeu de Sus and beyond. The pride of village is the old wooden church of the Birth of the Holy Virgin, built around 1639. Sapanta village, where is located also the famous Merry Cemetery. Rona de Sus is a big commune formed of Coştiui and Rona de Sus villages, 4 km further up the road from Rona de Jos. The people of Coştiui have become famous for their skill as coopers, making oak barrels. In the commune there are two natural reservations: the 62 ha Oak Grove Ronişoara, and the 0.7 ha Larch Grove Coştiui.